that best suit your budget! 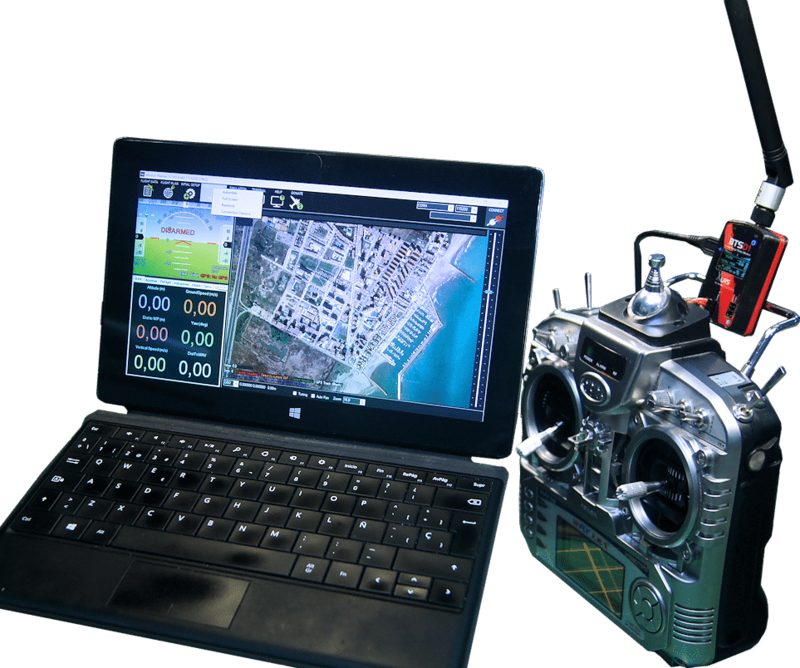 There are two radio modules (TX and RX) that can work in different modes for different FPV & UAV applications. Transparent Data Link (Radio Modem). They can also work with only one mode or with several modes at the same time. Transparent Data Link + Radio Control. Transparent Data Link + Radio Control + Terminal search (Location of lost drones). 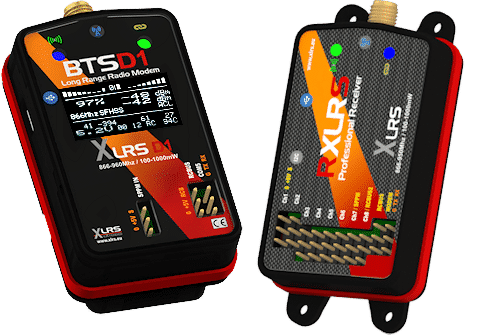 The XLRSD1 system has a new fresh point of view, is up to 45% more economical than XLRS D2 but with almost all the benefits, because the system is scalable and can choose their functionality and final cost according to the XLRS licenses. With Mavlink protocol and transparent protocol. 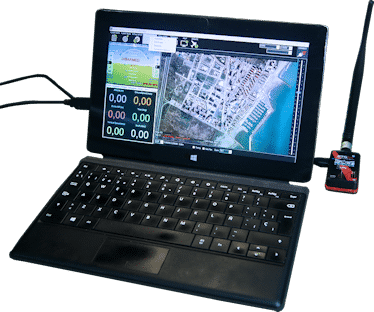 On the ground BTSD1 Transmitter sends and receives data via USB connect directly to the PC or tablet. It is compatible with Mission Planner, QGroundControl, DMD_Studio, etc. In the vehicle connect the “MODEM” port (GND,TX,RX) of RXLRS receiver to the “TELEM” port of the autopilot or the data port of another device. 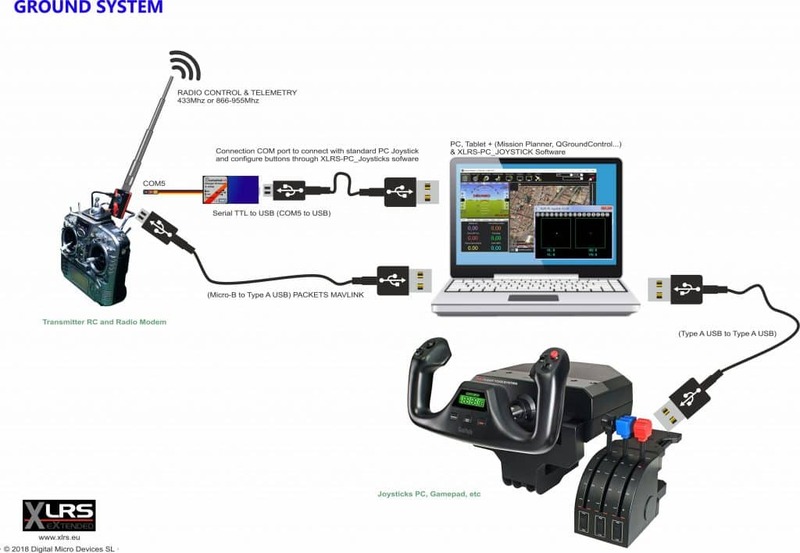 It is compatible with Pixhawk, APM, etc. 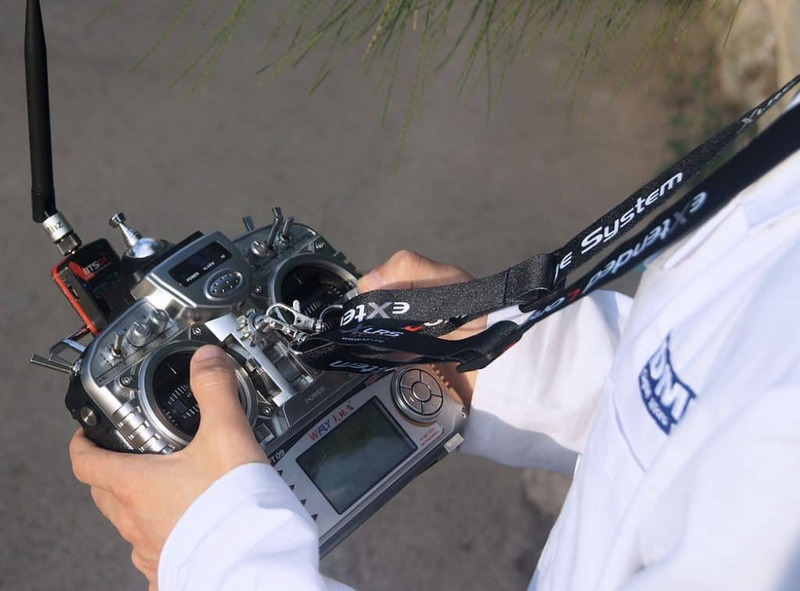 If you activate the RC XLRS license, you can use XLRSD1 as a radio control system, saving modules, space and antennas in the Drone and the ground station. Connect the trainer port of your standard RC Transmitter (radio control) to the SPPM input of the BTSD1 and will automatically detect the Joysticks and channels of the RC transmitter, sending them to the RXLRS receiver where will be activated the ports of 8 servos of which one of them can be series output of up to 13 SPPM servos to connect with the autopilot. Can connect to the PC via USB or if you are using the system as a radio modem via the RCBus port (you will need a BootADMD or serial converter). The usb with a extension cord can have up to 25m, so you can install the module near the antennas so as not to have lost with the antenna cable and prepare a control base controlled with PC, Joysticks and personalized video. From USB to the RCBus port (you will need a BootADMD or a serial converter) with ACL commands. This utility will allow you to locate and find lost vehicles or aircraft using the RDB_RECOVERY radio beacons. Very useful if you fly far or in complicated environments such as in the jungle, mountains, cornfields, etc. And you have to make an emergency landing or suffer some mishap and lose his valuable dron or plane. Operation: To activate the search screen you have to change the value of Channel 6 to the minimum, it will automatically change the screen of BTSD1 and access the search screen. 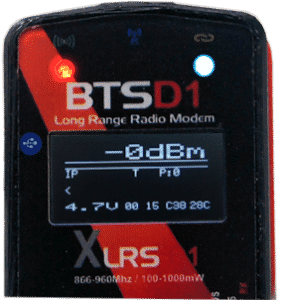 1- BTSD1, Transmitter RC XLRS and/or Radio Modem and/or Search Terminal. 2- Omnidirectionals Antennas 2.4Ghz 5dBi. 1- Omnidirectional Antena 5.8Ghz 3dBi. 1- Directional antenna patch 6-9dBi, 790-960 MHz & 1700-2700 MHz. (Optional). 1- Mavlink Telemetry and Transparent protocol (optional). 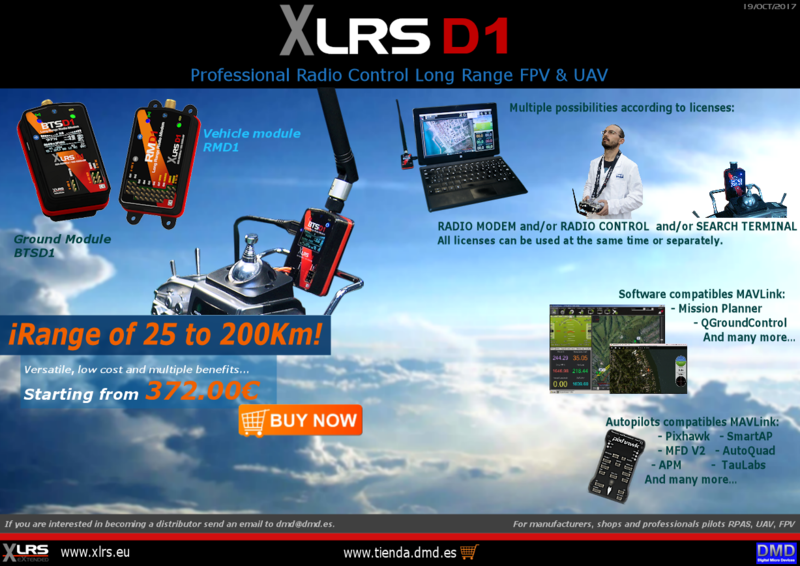 1- Radio Control XLRS (Optional). 1- Searcht Terminal + Radiobeacon (Optional). 2- Cable SMA-Female to SMA-Male, 540mm. 1- Cable Servo RC Female to Female. 1- Extensor Cable Servo RC Male to Female. 1- Cable adapted for Pixhawk-RX. (Only with Radio Modem license). 1- Cable USB-A Male to Micro USB-B Male, 2m. 1- Cable Audio Stereo MiniJack 3.5M/M to RC Female Connector. (Only with Radio Control license). 1- Adapted cable RC standard Transmitter trainner port to Female MiniJack. (Only with Radio Control license). * The content of the product may vary depending on the options selected. Long Range professional receiver up to 200Km or more depending on antennas and installtion, with Mavlink Telemetry and transparent radio modem of 38.4kb to 100kb. Control 16 servos distributed between 8 PPM outputs and 1 SPPM configurable output of 8 to 16 servos. AES Encription in RF, (Optional). 5th generation radio of Digital Micro Devices. We are the manufacturer of RF module. Multi-band ISM: 866Mhz, 868Mhz, 902, 915Mhz, 950Mhz or 433Mhz (optional). Power: 500 or 1000mW (according XLRS licenses). Sensitivity: -110 or -116dBm (accoding XLRS licenses).